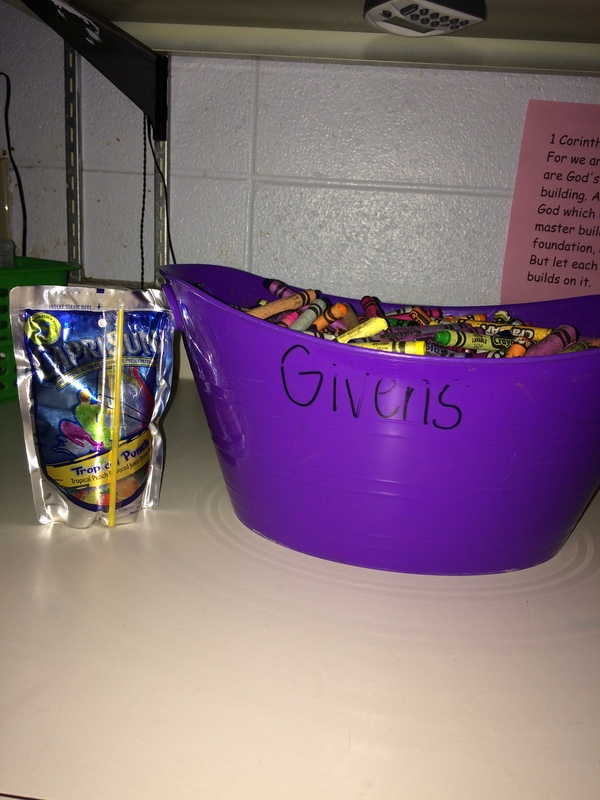 In my classroom, we have this bucket. We call it the crayon bucket. Its job is to hold two kinds of crayons: the broken ones and the forgotten ones. We started out that first day and everyone had a brand new pack of shiny, beautiful, pointy crayons (by the way, I quickly learned that you don’t give a class full of kindergarteners an entire pack of crayons on day one…teaching 101). Now I do a crayon a day. As we learn each color, if we treat our first crayon nicely, we get to keep it and eventually get more, but anyway, that’s another story! So I started setting the lost crayons on my desk. But soon there were too many for my desk. And during my first year of teaching I had so many overwhelming roles to learn that even though I was bothered by these forgotten crayons, I didn’t have the time or energy to think of a solution for them. So I got a cup, and they quickly filled up the cup. So I got a basket, and they began to fill up the basket. And then another thing started to happen all those years ago that really bothered me… when we went to do a special art activity, I’d say something like, “Get out your red…” and immediately several people would chorus “I don’t have a red!”–especially two crayon guy…he never had anything! So one day the light clicked on for me. The crayon basket, of course! It had all the reds we needed! I started a new procedure that has been tried and true since that first year I started teaching. We have the lost crayon basket for when someone is missing a color. The rule is if we are missing a color, we don’t yell out. We just go to the crayon basket and pick out what we need, and the best part of all is… we get to keep it! And do you know that the child who was so forgetful with her crayons earlier takes that “new” red one from the basket, uses it carefully, and then gently puts it in her pouch and is sure to zip up her pouch this time so that she doesn’t lose it? The rule at the crayon basket is that we can only stay there for five seconds, because we are guaranteed to find the needed color in five seconds. You know why? Because after ten years, this is my lost crayon basket bucket. It’s full of every color we would ever need! A lot of crayons get forgotten. Until they are needed. And if a child has forgotten a blue crayon, when the teacher says to get a blue, the crayon becomes very important to the child, and it’s no longer forgotten. Especially when the child knows they get to keep the blue. It’s a treasure to them now, and they are glad to keep it. 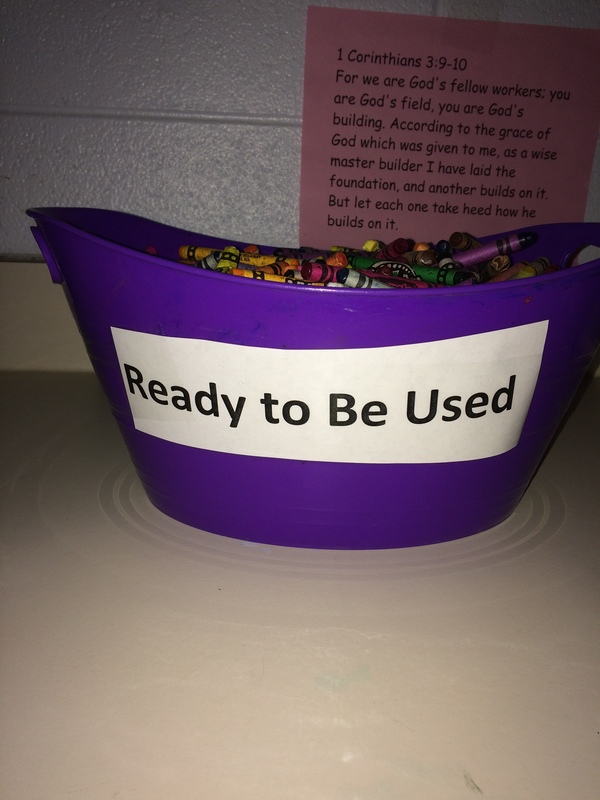 The great things about the crayons in my class’s crayon bucket is that they don’t stay forgotten. They sit in the bucket, ready for the time when someone needs their exact use. And then it’s their time to shine! They become very important to the ones who need them. There’s another kind of crayon in the bucket…and that’s the broken crayon. Now, broken crayons are the most special ones of all! They may not be as pretty as the new ones; they may be missing their paper, their shine, their points, but they have a very special job. You see, we have a lot of students coming to public school these days with certain learning, physical, and emotional needs. For a number of health, environmental, or unknown reasons, they don’t have the fine motor abilities to color and cut and write like a “typical” kindergartener. Some of them have never even held a crayon, so it’s hard for them to learn how to fill a picture with color. I remember the first time I had a student with a physical need that required more practice than what I was providing in the general setting…the wonderful occupational therapist for the county came in and looked over his workspace to help me and give me pointers on supporting him with writing, coloring, and other fine motor skills. And guess what she did first? Broken crayons make weak hands strong. Kids who can’t hold a pencil can grip a broken crayon. They have to bear down and hold it tightly with correct finger positioning when their crayon is broken. And I have also learned that kids who need emotional and behavioral support love to use broken crayons. They can bear down and push and scribble and make really strong marks with broken crayons without fear of getting in trouble for tearing up something new. I know that some people reading this today feel like an old broken or forgotten crayon. You may be broken down by physical health problems or relationship issues. Or you may be chipped away by little things of life every day…a cruel word chips here, a busy schedule nicks there, until one day you look in the mirror and you are only half of the person that you thought you were. I have great news for you, friends. You are not forgotten. You may feel that way, and feeling that way is hard–sometimes awful!–but our human feelings are very fickle things. They change with our circumstances like a tree sways in the wind. God’s word never changes, though, and He says that we are not forgotten. You know those crayons in the lost and found bucket? They’re really not forgotten, either. They are just waiting for their time to be used. Are you ready to be used? Sharing with friends at sweettothesoul.com, purposefulfaith.com, Tell His Story, and holleygerth.com. This entry was posted in Devotionals, Teaching and tagged broken, forgotten, Isaiah 49:15-16, Not forgotten, Paige Givens. Bookmark the permalink. This is so beautifully put. Thank you to the people who can put their thought to paper like this! Thanks for reading and encouraging Karen! A beautiful, amazing story. I was a teacher for many years. This is such a creative idea and so true. I am now many years older, birthday Aug 1, and still miss my teaching years. I am broken, on a scooter most of my waking hours, speech impaired, but God does have purpose for brokenness.God bless you for being a wonderful, creative teacher! Thank you so much Winnie! Yes, He will still use you! Thank you. Your words uplifting and a great reminder. Love this! I can tell you have been in the classroom. Thank you for these words of wisdom! I am an elementary school janitor and i too find many crayons on the floors of classrooms.Now I know what to do with them. Your students are blessed to have you as their teacher. Thank you for teaching and sharing your wisdom. Thank you Rebecca!!!!! You are a teacher’s best friend! We don’t know what we’d do without our custodians. You get there before us and often leave after us. Thank you for your service to your community!!!!!! Jackie Looper: When I started teaching at Holly Springs many years ago, I had a crayon box that was kept in the back closet. It worked similar to your crayon basket. One day I found some snuff boxes in the crayon box after school when I was straightening up in the classroom. You won’t believe what I did. No other teacher would have had the nerve. I emptied the snuff into the trash can, took the empty snuff can home and filled it up with pure cocoa. Those boys were in for a great surprise when the next day when we left the classroom to go down to the playground. I stayed outside the classroom door and waited. They were about to choke to death. They wanted a drink of water in the hallway. I told them “no water yet”. When we traveled down the hill where there was a water fountain, I allowed them to get water and spit our the bitter cocoa. Those little “gents” never brought any more snuff to school ever again. Poor little things! And they never forgot that incident to this day ! Thank you sometimes we need to know even the broken is still beautiful! I loved the story and will use it for the homework lab! I love this story and it’s inspiration. There is beauty in broken things when we see their true value. God definitely saw through our brokenness and made a way for us to shine as His children through faith the precious blood of Jesus,His beloved Son. I had a student who broke all his crayons. One day I asked him why – beloved to hear the sound of the crayon cracking. Wow! 41 years. How amazing. I’m sure you have incredible wisdom to share! Wonderfully written. A long paragraph, but lovely and appreciated.